There was a time, not so long ago, when the principle means of telling the time for most folks was their watch. If you needed to know the time and had forgotten your watch you would have to find someone else with a timepiece or somewhere with a clock because those were your only options. These days things are very different and the time is everywhere. Almost everyone on the planet has a mobile phone, a tablet or a computer and the TV also displays the time. Watches play a different role today with quality timepieces being valued as fashionable accessories, status symbols, investments or as technological aids for adventure sports enthusiasts. When you think of high end watches and hi-tech functions you probably think of Swiss manufacturers. Cheaper non-mechanical models are throw-away items which are discarded when the battery fails. In the midst of this constantly evolving role for watches one significant band has probably been unfairly underrated and that brand is Citizen. Citizen is the largest watch manufacturer on the planet but possibly because the company is Japanese it has failed to achieve the same kudos as its Swiss rivals. Its current day focus on non-mechanical watches perhaps puts the company in a different arena to Swiss watches. With citizen the focus is on affordability, functionality and practicality. But credit should be given where it is due. Citizen has an impressive history of technological innovation and now boasts laudable environmental credentials. The company began in 1918 as the Shokosha Watch Research Institute and produced its first pocket watch in 192. The Mayor of Tokyo was impressed and dubbed the new timepiece “The Citizen” n the hope that such a luxury item would one day be attainable by ordinary people. The name stuck and the organisation became the Citizen Watch Company in 1930. Since then Citizen have been technological innovators producing many world’s firsts including a revolutionary voice recognition watch, the first professional dive watch with electronic depth sensor and the first titanium watch. 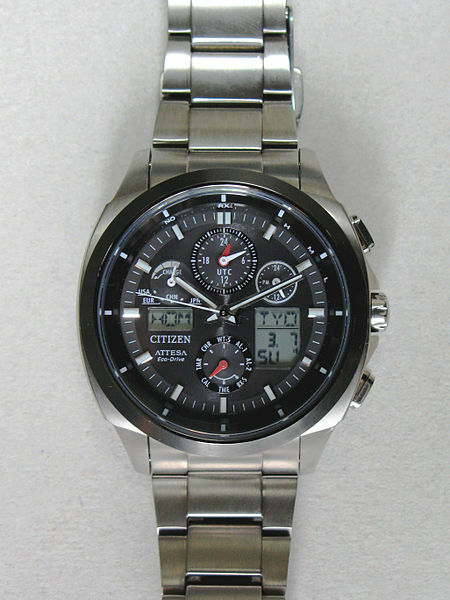 In 1993 Citizen launched the first multi-zone radio-controlled watch now more commonly called an atomic watch. Indeed you could write an entire book on innovations at Citizen. Another innovation was the Cryston solar cell wristwatch which has evolved into the Citizen Eco-Drive series. These timepieces are powered by light, any light, and so never require winding or new batteries. This environmentally friendly technology has saved over 40 million batteries from ending up in landfill and will prevent millions of watches from being cast aside in the future when the batteries have failed. These watches also reduce the use of harmful chemicals in battery production and their eco-friendly credentials should not be taken lightly. As the largest watch manufacturers in the world Citizen are clearly doing something right but appear to lack the street credibility of their Swiss rivals. As environmental concerns are increasingly to the fore this situation may well change and Citizen should certainly be revered right now as innovators in their field. This entry was posted in Brands and tagged citizen, japan, timepieces, watches. Bookmark the permalink.